Hybrid Operating Room & Neurovascular Suite Imaging System: IMRIS Intraoperative MRI & CT. Hybrid Imaging System, Hybrid Angiography Suite, Hybrid IR Suite, Hybrid Neurosurgical Suite, Intraoperative MR, Intraoperative CT, Hybrid iMRI. Philips, Siemens, GE, Toshiba, SKYTRON. Please utilize the below videos & web links as a resources for exploring the innovative imaging systems for Hybrid Operating Rooms offered by IMRIS. 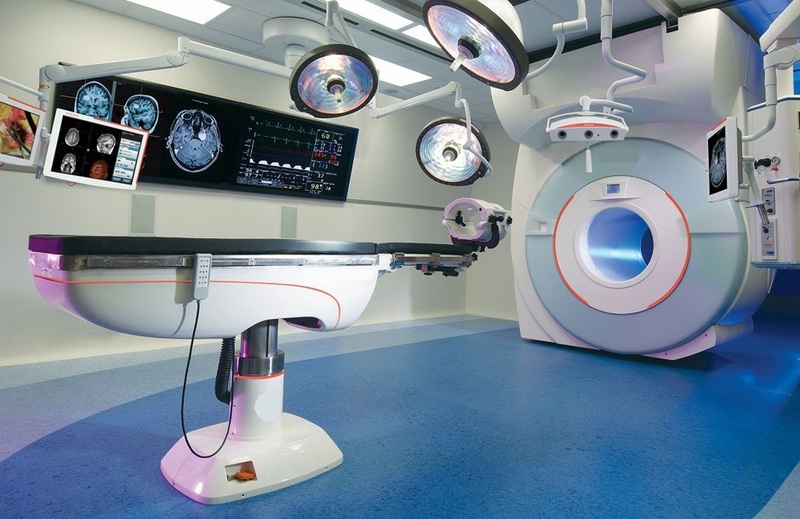 Hybrid surgical theater with integrated three-room suite that will provide intraoperative MR imaging and biplane x-ray angiography for a wide range of neurosurgical, neurovascular and cardiovascular procedures. Hybrid surgical theater with integrated two-room suite that will provide intraoperative CT imaging and a operating room for a wide range of neurosurgical, spinal procedures. Magnetic Resonance Imaging, or MRI, allows surgeons to distinguish a tumor from healthy tissue and helps them determine if they have successfully removed all of a tumor. In the past, surgeons had to rely on MRI images taken before surgery, and then wait until after surgery to confirm the entire tumor was removed. With an intraoperative MRI scanner (IMRIS), an MRI can be performed during surgery, right in the operating room. This lets neurosurgeons see real-time images of the brain, so they can check the progress of surgery and make adjustments as necessary. The IMRIS moves back and forth on rails between two integrated operating rooms, allowing surgeons to bring the MRI technology to the patient, rather than moving the patient. This can be particularly helpful for people who are in critical condition. This advanced technology helps neurosurgeons safely remove more of a tumor, and reduce the need for follow-up surgery. The IMRIS also enables neurosurgeons to avoid critical areas by allowing them to see more sections of the brain during surgery. The IMRIS suite combines magnetic resonance imaging (MRI) with biplane angiography (captures X-rays of arteries and blood flow) for extremely targeted, image-guided treatment. This advanced system allows neurosurgeons to evaluate the success of brain tumor removal while in the operating room. In the past, neurosurgeons needed to complete surgery and then do an MRI.